The first day of the Barbecue meeting has established itself as a highly popular fixture, featuring some fantastic racing action including the valuable Handicap Hurdle race with the Cumbria Crystal Trophy and our only female jockeys race. Racegoers are welcome to bring a barbecue and can even order BBQ packs of meat with advance race-tickets. * Advanced online bookings only, group discount not available on the day or for concert race days. There are two types of general admission tickets at Cartmel: Paddock Enclosure and Course Enclosure. A description of each enclosure is given below to help you make your ticket choice. Tickets for each race day can be purchased upon arrival at the racecourse. However, we strongly encourage you to purchase tickets in advance. The Paddock Enclosure contains the Grandstand and Paddock, Parade Ring/Winners Enclosure, Marquee Village and the Louis Roederer Restaurant. The main racecourse office is also located in this Enclosure. Holders of a Paddock Enclosure ticket can move freely over to the Course Enclosure at the track crossing point. Crossing is not permitted while horses are on the course. This ticket grants admission to both the Paddock and Course enclosures plus exclusive access to the 1856 Lounge inside the Paddock enclosure. Within the lounge there will be drinks available for purchase from a Champagne Bar and a Cocktail Bar, a DJ will play until 8pm and you can enjoy a luxurious garden terrace. A carefully selected menu of snacks will be also be available for purchase from our exclusive caterers, Campbell & Rowley. This ticket is for over 18’s only. The Course Enclosure is situated on the opposite side of the finishing straight from the Paddock. The main features of this Enclosure are the fairground, trade stands and market stalls. Transfers are possible to the Paddock Enclosure at the track crossing point if you are in receipt of a Paddock Ticket or Upgrade Ticket. Crossing is not permitted while horses are on the track. If you are a group of 10 or more people, we can offer you a further discount if you book your tickets in advance (this offer is not available to customers purchasing tickets on the day of racing, for concert race days, the 1856 Lounge or on other special rates). Online purchases of 10 or more tickets of the same type will automatically receive a 5% discount. No discounts will apply to concert racedays. When purchasing your tickets in advance you can also purchase vouchers to enhance your day.  If you’d like to book vouchers for Champagne or for the Fairground, simply select the date you wish to attend then select the number of vouchers you require for that particular race day. Treat yourself or a friend to a bottle of Louis Roederer Brut Premier Champagne. Cost £59 per bottle. Great for children and adults, purchase your voucher in advance and you can get £15 worth of rides (tickets) for just £10. Single Annual Membership is now available for £150.00 For more information or to make a booking please call the office 015395 36340. Please click here to download our list of confirmed 2019 reciprocal race days. Cartmel Racecourse is most easily accessed from junction 36 of the M6 via the A590. Follow the signs towards Barrow and Ulverston until you reach the turn-off for High Newton, where you will also see a sign for Cartmel Priory and pick up our temporary yellow event signage. The lanes around the racecourse are very beautiful, but also quite narrow. To assist with the traffic management, we make several of the lanes one-way – so it is particularly important that you follow the event signage and NOT your sat-nav. Look out for signs to your preferred enclosure, Paddock or Course, as the entrance routes are at different ends of the village. It is strongly recommended that you aim to arrive well before the first race, as access to the Racing Enclosures will be limited afterwards. Parking on the inside of the track costs £6 per car, while parking in the fields outside the racecourse is free – so please don’t try to park on any of the roads in or near the village as this is likely to cause an obstruction. If you are planning to travel by taxi, it is strongly recommended that you book now, as it is unlikely that there will be many available on the day. Although taxis can drop off at the racecourse, it is easier (and cheaper) for them to drop off and pick up from the lay-by opposite Cartmel Priory School, near the Pig and Whistle public house. 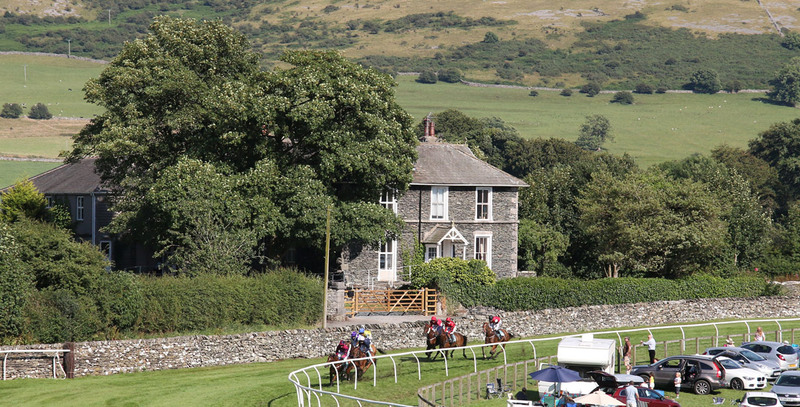 The closest station to Cartmel Racecourse is Cark-in-Cartmel Train Station. Stagecoach will provide a bus service between Cark-in-Cartmel Station and Cartmel village before the first race and after the last race. Provision can be made for helicopters to land nearby the racecourse. Permission must be sought in advance. Parking for coaches is available in the designated Coach Park. Coaches are unable to park in any other car park other than the coach park area. Coach party organisers should inform the Racecourse Office that they will require a coach parking space 5 days in advance of the raceday if possible. Car parking in the Paddock Enclosure is limited and costs £7 per car. We encourage you to arrive early to obtain access to the main Paddock car park. This will sell out on Bank Holidays and overflow facilities will be used. Whilst overflow and 7 Acres parking is free, a charge of £7 per car will be charged for cars wishing to park within the course enclosure on all race days. The racecourse welcomes coaches and minibuses free of charge in the coach car park only. Access to this car park is from Cartmel village. Small Camper vans wishing to park in the course enclosure will be charged £7. No parking is permitted for coaches, minibuses and camper vans in the Paddock car park or in the Hill and Stream Members car park. It is advisable for coach parties to purchase tickets in advance. Racegoers are permitted to put up their own gazebos in allocated areas (a member of the Cartmel staff will advise). A charge of £15 is payable on the day for each gazebo erected based on the gazebo being a standard size of 3m x 3m. Multiples of this charge will apply to larger gazebos. Unfortunately, gazebos are not permitted next to the running rail or within 10 metres either side of a jump, as they obscure the view of other racegoers. Please also note no gazebos are permitted on either side of the finishing straight. (Course/Paddock Running in Rail enclosures). Gazebo’s are not available to hire from the racecourse and may not be permitted in high winds. Few people can resist an invitation to a day at the races. Our unique party atmosphere at Cartmel means there is no better way to celebrate a special occasion with family or friends or to entertain business clients or staff. The relaxed surroundings of our hospitality areas ensure privacy and comfort, whilst still located in the heart of the racing action. The mix of informality and entertainment provides an exceptional ambience for building business relationships; we guarantee your guests will never be stuck for something to spark the next conversation! Our hospitality packages take all the hassle out of organising such an event, leaving you and your guests to enjoy the day. We can accommodate both large and smaller parties within our flexible hospitality marquee arrangements. Our chalet suites are your private area for the day and are located within a screened section of the main marquee. Perfect for groups of 30 or more guests, chalets are available from mid morning on race days so guests can get together and enjoy the preliminaries of a busy day’s racing. Chalet dining includes a hot & cold buffet lunch and afternoon tea featuring local, seasonal produce which has been carefully selected by our exclusive caters, Campbell & Rowley. Afterwards there is no need to rush away, why not let the traffic disperse and make full use of your facility. If you are celebrating a special occasion, party organisers can access the chalet from 10am to put up temporary decorations. What’s included in a Chalet Suite package? Separate drinks packages are also available and can be tailor-made to your requirements. For prices, more information or to make a booking, please contact the racecourse on 015395 36340. Our party tents are perfect for smaller groups to celebrate special occasions, providing a handy and centrally located base whether rain or shine. Situated within the Tented Village in the Paddock Enclosure, these 3mx3m mini marquees are decked with bunting, garden furniture and a table to lay your picnic on. As this is not a catered package, you are welcome to bring your own food and drink along. Alternatively you can pre-order food: ‘Seafood, BBQ or Vegetarian Platters’ or the ‘Pizza and Salad deal’ which are priced per person and various drinks packages available at the point of booking. Our party tents are perfect for up to 15 people, however double sized tents can be built to accommodate larger parties between 15 and 30 people. One free parking space per 3m x3m party tent is available (ideal for bringing along the food and drink). Please note that paddock admission tickets must be purchased for all attending (under 18’s go free). What’s included in the Party Tent package? Party tents are available to book online from November 2018, however for general queries, please contact the racecourse on 015395 36340. Enjoy delicious cuisine in comfortable surroundings whilst soaking up the racing atmosphere from our one of our three exclusive restaurants. Rogan & Co at Cartmel Races is being launched as an exclusive new venue for the 2019 racing season. It will combine the culinary excellence of Rogan & Co, Simon Rogan’s Cartmel-based Michelin starred neighbourhood restaurant, with our first trackside hospitality offering at the Racecourse. Located opposite the Grandstand, the restaurant will take the form of a stylish glass-fronted marquee complete with garden terrace overlooking the famous finishing straight. Racegoers can enjoy a beautiful, seasonal three course lunch from their private table, featuring a menu of home-grown and locally sourced ingredients, many of which are grown by Simon’s team at their farm just a mile down the road from Cartmel. What’s included in the Rogan & Co at Cartmel Races package? The Louis Roederer Restaurant is located on the first floor of the Grandstand (within the Paddock Enclosure) and boasts panoramic views of the racecourse, finishing line and the parade ring. It has a private viewing balcony and access to the front steps of the Grandstand…perfect for enjoying a day’s racing in style! Racegoers can enjoy a delicious a la carte meal from their private table designed by our exclusive caterers, Campbell & Rowley as part of the package at the Louis Roederer Restaurant. What’s included in the Louis Roederer Restaurant package? The Ilex at Cartmel is located in the hospitality marquee which runs parallel to the finishing straight in the Paddock Enclosure. It provides racegoers with a more casual atmosphere from which to enjoy a delicious Buffet Lunch. Your table is exclusively yours all day, providing you with a base from which to enjoy the days racing. What’s included in The Ilex at Cartmel package? In addition to two large public bars, one in each enclosure, you’ll be able to find a selection of our own real-ales in the Winster Valley Brewery Real Ale Tent, plus of course everything you’d expect to find to eat including fish & chips, prime quality beef burgers, bacon rolls, ice cream, etc. Look out too, for our local food producers – Furness Fish & Game who will be selling their own venison burgers in addition to the, now-traditional, barbecue packs of meat and potted shrimps, Cartmel Sticky Toffee Pudding and Cartmel Cheeses. 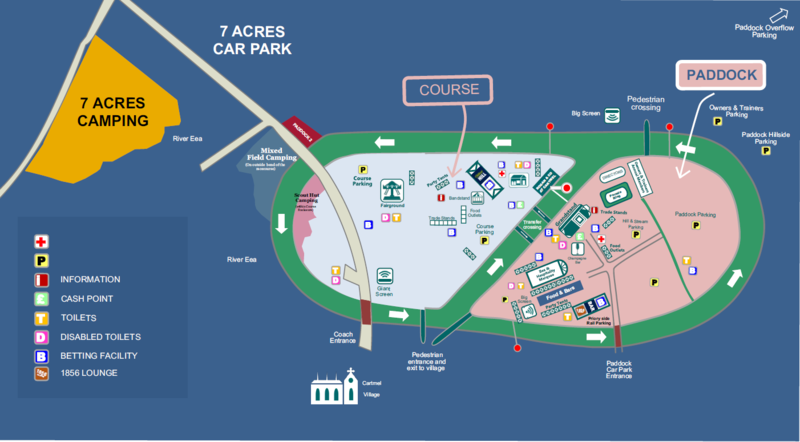 The 4 designated camping areas are located at the southern end of the racecourse, within and just outside of the Course Enclosure which offers racegoers the opportunity to camp close to the action. The four areas are: 1) Scout Hut, 2) Mixed Field, 3) Paddock 2, and 4) Seven Acres. Areas 1-3 admit Camper Vans, Motorhomes and touring caravans, with tents also admitted in Area 2. Area 4 admits tents only. Please note, campers located close to the running rail may get wet if the track requires irrigation. Full Season Camping Package – for a minimum of 2 people. Includes a camping pitch for all our race meetings and fixtures plus two annual membership badges (granting Paddock Enclosure admission for all racedays plus more than 45 reciprocal racedays at other tracks in Britain and Ireland). Extra campers can be added on to this package. This package must be booked by telephone with the Racecourse Office on 015395 36340. Single Meeting Camping Package – The pitch fee includes a camping pitch for the duration of any single race meeting; 4 nights for either May, June, July or August or optional 6 nights for May only (arriving the day before the first raceday from 10am and departing by 11am on the morning following the final raceday). With this package a minimum of one admission ticket for either the course or paddock enclosure must be purchased, with the option to add on additional admission tickets (up to a maximum of 4 adults per pitch) or child camping tickets. Single Raceday Camping Package The pitch fee includes a camping pitch for 2 nights over the duration of any single raceday; (arriving the day before the raceday from 12 noon and departing by 11am on the morning following the raceday). With this package a minimum of one admission ticket for either the course or paddock enclosure must be purchased, with the option to add on additional admission tickets (up to a maximum of 4 adults per pitch) or child camping tickets. A CHILD CAMPING TICKET (FOR CHILDREN AGED 5 – 17) MUST BE PURCHASED FOR ALL CHILDREN CAMPING. Child camping tickets are £5 per child per night. Admission to the races for children under 18 is free. (With the exception of a Concert Race Day when there will be admission prices for any children aged 13-17 and a ticket will be required for all ages. Please take care to read the ticket description at checkout and ensure you book the correct camping package for your child(ren)). We welcome motor-homes, caravans and tents, although almost all of the camping space provided is on grass – parking on hard-standing can not be guaranteed. We will provide access to water, toilets, porta-showers and an Elsan point. There will be no electricity supply available to campers. The amount of pitches available is limited, so early booking is recommended. Our safety information is designed to help you enjoy the racing & concerts in safety. A day at Cartmel Racecourse should be great fun for everyone; nobody wants an injury or an incident to spoil their day. So, when push comes to shove, we need to make sure that there isn’t any pushing or shoving. Fortunately very few accidents occur at Cartmel Racecourse, but those that do are most likely to be relatively minor incidents involving someone who has had too much to drink. Quite simply: you’ll be safer if you drink less alcohol. On the rare occasion that we receive a customer complaint, it’s quite likely to be linked to the behaviour of someone who’s had one too many. So please drink responsibly and encourage your friends to stay within their limits. Any incident involving substance abuse will be dealt with by Cumbria Police. The most common cause for a visit to the St Johns Ambulance tent is sunstroke. Okay, that’s only on hot days… The most common cause, on a normal day, is a grazed knee. Many of these customers are either under the age of five years or they have had one drink too many (see previous point about alcohol). Customers are reminded that the natural parkland, that forms the racecourse, includes many uneven surfaces which may become slippery in wet conditions. Please take care of yourselves and mind where you walk. Don’t try to run faster than your legs can go, even if you think your bookmaker might be packing away for the day. The fences, walls and temporary barriers located on the racecourse are intended to segregate people into specific areas. This may include segregating people from horses or people from sensitive or hazardous equipment. Please do not attempt to climb over, sit on or stand on any barriers – regardless of whether they appear to be permanent or temporary features – they are not designed to take a person’s weight. The scenery at the racecourse is enhanced by beautiful trees, including some very old oaks. However, despite clichés such as ‘strong as an oak’ it should be noted that all trees are capable of shedding branches with little warning. While we inspect all the trees on the racecourse annually, we recommend that you do not sit beneath the branches. We especially ask that neither children, nor adults, swing or climb on the branches of trees within the parkland. Children are naturally attracted by the water in the beck that meanders through the Paddock Enclosure. For reasons that should be obvious, we recommend that children are supervised at all times. We also recommend that anyone paddling in the beck wears shoes or boots to protect their feet. Animals use the beck upstream (and downstream), so please do not use the beck for washing up your picnic utensils, for drinking or for cleaning your hands. Horses are big and run very fast; hopefully yours will run fastest of all. Please pay attention when in close proximity to the horses: stay on the public side of any barriers (close to the track or horse walk areas) and do not sit on or lean over barriers near to the horses. The running rails are designed to encourage the horses to stay on the track – but they will not withstand a horse’s weight if they hit them, nor a jockey’s if he is thrown over them – so be prepared to move if a horse is behaving erratically. Be aware of moving vehicles at all times. If you are driving a vehicle, please pay special attention to pedestrians. Every year the first aid team will treat at least one person with burnt fingers and we will be required to extinguish at least one fire in a wheelie bin. If you intend to bring a barbecue, please ensure that you handle it safely, take care not to scorch the grass and dispose of it in a metal bin – only when it is fully extinguished. No gas barbecues or gas canisters are permitted on the racecourse. There are usually lots of children at Cartmel races. Although we don’t consider them to be particularly dangerous, we do ask all children to be appropriately supervised by a responsible adult – who should be particularly mindful of all the considerations above. First Aid posts are located in both the Paddock & Course Enclosures. In the Paddock Enclosure the First Aid Post is located next to the blue Ticket Hut on the entrance driveway. In the Course Enclosure, the First Aid Post is located opposite the Grandstand at the rear of the Cricket Pavilion. At Cartmel we request that racegoers wear smart casual dress in the Paddock Enclosure, especially in the restaurant areas. Although the atmosphere is always informal, we ask that shirts are worn in all enclosures please. T-shirts and shorts are acceptable in hot weather. Wellington boots and macs are recommended in wet weather. Please dress for your own comfort. Dogs are allowed in both the Paddock & Course Enclosures on all racedays – as long as they are kept on a lead at all times and are cleaned up after. If dogs are left in cars and are deemed to be distressed a public address announcement will be made, failure to respond will result in the dog being released. Restrictions may apply on a concert race day. We accept no responsibility for lost, stolen or forgotten badges, PASS Cards, tickets or other entitlements. The Racecourse has no obligation to replace a lost, stolen or forgotten badge, PASS Card, ticket or other entitlement. In the event that we decide to replace a lost, stolen or forgotten badge, PASS Card, ticket or other entitlement, we may charge a fee to do so. Cartmel Racecourse tries where possible, to provide an accessible environment for all racegoers and we are happy to assist with any accessibility queries in advance of our racedays. The racecourse has relatively few permanent facilities and much of the raceday infrastructure consists of temporary marquees. However, we can provide wheelchair access to a special viewing platform high on the Grandstand via the lift at the back of the Grandstand. All users of this facility must have a dedicated carer with them at all times in case of an emergency evacuation. We try to ensure that all racegoers at Cartmel are parked according to their needs. We therefore provide forward parking areas for Blue Badge holders in both enclosures close to the finishing straight. These areas are relatively flat and grassy, making wheelchair access easier than most other areas of the racecourse. There are a limited number of forward parking spaces in the paddock enclosure which are available to pre-book by calling the racecourse office with your car registration and Blue Badge number. These spaces will be charged at £6 per car per day which is payable at time of booking over the phone with a credit/debit card. You will then be sent a hanger to display on your rear view mirror. Please note that if you have not arrived and taken your parking space by one hour before the first race then your parking space may be allocated to someone else and your payment forfeited. Your payment will be refunded in full if you cancel by calling the office on 015395 36340, 1 day before the race day. If all the places are fully booked then we shall take your details and put you on the reserve list so that when you arrive the stewards can do their best to park you in the most convenient place possible. Within the Grandstand building, there is a wheelchair accessible toilet on the ground floor level. Service animals (Registered Guide Dogs, Hearing Dogs and Medical Alert Animals) are welcome at Cartmel Racecourse. We know that every day your horse runs it will be a special day for you. Not every owner can stand in the Winners’ Enclosure on each raceday, but we still hope that you will really enjoy your visit to Cartmel. We offer all owners six admission badges per runner. Please note that these badges are for your guests and should not be transferred for cash. Syndicates and Clubs may purchase additional admission badges for joint-owners at half price from the Owners & Trainers Entrance. We have relocated the Owners & Trainers Bar to a position just north of the Parade – to improve your view of the Parade Ring and your horses. The bar also has a view of the large screen opposite the Parade Ring. We shall be offering all Owners & Trainers a free lunch – served as a buffet in the Owners & Trainers Bar. Please note that tickets for lunch must be obtained in person by the appropriate individual from the Owners & Trainers Ticket Hut on entry to the racecourse and will be limited to four per owner (irrespective of the number of runners) and two per trainer. Additional lunch tickets may be purchased at the cost price of £15 per person, subject to availability. Lunch tickets must be picked up by the individual or lead-syndicate /partnership member named in the race programme – please bring your PASS card for identification. Tickets are not transferable unless expressly requested, by the owner, by telephone on the day before racing. Owners & Trainers parking will be provided on the outside of the racecourse in Car Park 2 – located to the north of the Paddock Enclosure and approximately 60m from the new Owners and Trainers Bar. The new parking area will provide more space for owners and a shorter distance to walk to the Parade Ring – as well as easier access / exit. Vehicles will no longer have to wait for the gaps between races in order to leave as the car park is on the outside of the track. Owners and Trainers will still be welcome to picnic next to their vehicles – which can be parked adjacent to the running rail, subject to available space. Most racegoers approach the racecourse by car from junction 36 of the M6 and the A590. The new Owners & Trainers parking area is located north of the Paddock Enclosure and is signposted with temporary, yellow, event signage from High Newton. Please look out for signs to the ‘Paddock’. We also arrange a bus service between the racecourse and Cark train station (costs £4 return) before and after racing for those travelling by rail. Helicopters can be landed if notice is given in advance. In order to access the Owners and Trainers Car Park, follow the same route as normal (as directed by the yellow event signage) until the end of Greenbank Lane, just opposite the racecourse, where you will be directed to the right – towards the new parking area. We offer all owners six admission badges per runner. If one syndicate owns two runners, they will therefore be allocated twelve badges and eighteen badges for three runners, etc. Please note that these badges are for your guests and should not be transferred for cash. Syndicates and Clubs may purchase additional admission badges for joint-owners at half price from the Owners & Trainers Entrance. All badges are allocated at the Owners & Trainers Office, which is located adjacent to the track in Car Park 2. Badge holders will be required to scan their tickets on entry to (or exit from) the racecourse during racing. Trainers and jockeys are admitted to the racecourse for work purposes (with or without runners) and we appreciate that they may wish to employ a driver or bring a family member – to whom we’d be pleased to allocate a Paddock Enclosure admission badge. Please note however, that these badges are not intended to be transferable. To assist with the scanning process at the racecourse exits and entrances, we’d be grateful if all metal badge holders (including racehorse trainers, BHA badge holders and RCA badges holders) could obtain a day-pass at the Owners and Trainers Office for scanning purposes. The Owners & Trainers Bar does not have enough seats to guarantee every person a seat at the same time – it is therefore not possible to reserve space in this facility. However, if you would like to reserve a table for the day, we currently have a limited amount of space in the Conservatory Restaurant – located in the main hospitality marquee. The Conservatory Restaurant package includes an excellent buffet lunch and afternoon tea – plus you will be able to keep your table for the full duration of racing, providing a useful base for the day. The package price (normally £95.00 per person) will be just £55.00 for owners and trainers. We strongly recommend reserving your space in advance of the race-day as availability is limited. To book or ask any further questions, please call the racecourse office on 015395 36340. We would be delighted to speak to you and ascertain the names of anyone who will be picking up badges on your behalf – or indeed if you will be picking up all of the badges yourself. Please e-mail us with your contact details (this message is distributed on our behalf by Weatherbys – so we do not necessarily have your e-mail address) or give us a call. (info@cartmel-racecourse.co.uk or 015395 36340). We really would appreciate your feedback on the new bar and parking arrangements (including free lunch) which will help us to direct our budget in future years. We look forward to seeing you and wish you a safe journey and the best of luck.